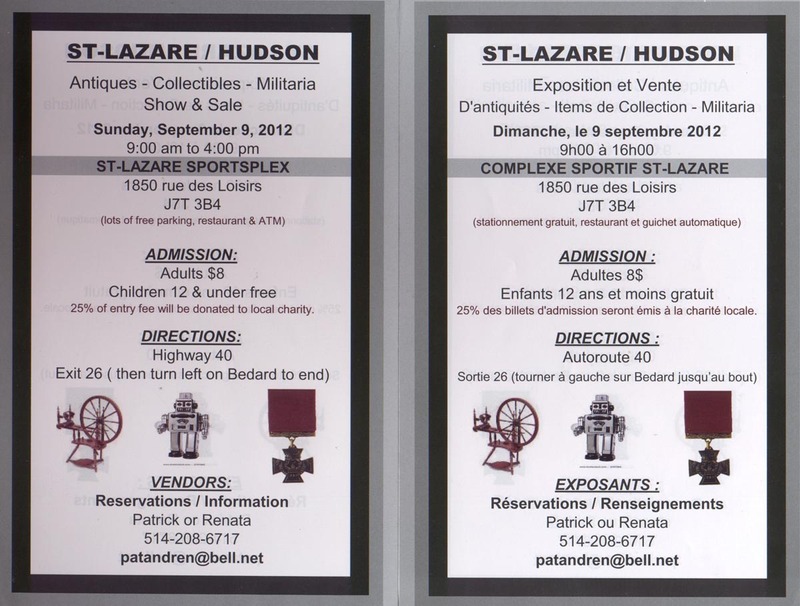 St-Lazare-Hudson Antiques, Collectibles, Militaria Show and Sale, September 9th 2012. We had some time to sit down and chat with Patrick and Renata (promoters for this interesting new show in the West end of Montreal). What type of items can people find at your event? How many dealers or tables do you plan to have? WE ARE AT 52 DEALERS WITH MORE PENDING CONFIRMATIONS. APPRAISOR WILL ALSO BE ON SITE. OUR GOAL IS 65 FOR OUR 1ST SHOW, AND 100 FOR THE NEXT. SPACE IS NOT AN ISSUE. Where and when will the event be held? How much is admission? EVENT HELD AT ST-LAZARE SPORTSPLEX, 1850 RUE DES LOISIRS, ST-LAZARE, QC J7T 3B4. SUN., SEPT. 09, FROM 9AM TO 4PM. ADMISSION $8 (CHILDREN 12 & UNDER, FREE). 25% OF THAT WILL BE DONATED TO THE VETERANS HOSPITAL. WE HAVE SPENT A LOT OF MONEY PROMOTING AND ADVERTISING THE SHOW AND HOPEFULLY, IN THE FUTURE AS THE SHOW GETS POPULAR, WE WON’T HAVE TO SPEND AS MUCH SO THAT WE CAN DONATE MORE. OUR GOAL IS TO SUPPORT LOCAL CHARITIES WHERE FUNDS ARE NEEDED MOST TO HELP PEOPLE IN NEED. Why did you decide to create such a show? How did this come about? And why in this area? WE HAVE ATTENDED AND PARTICIPATED IN MANY SHOWS AND MET MANY DEALERS ALONG THE WAY AS WELL AS PRIVATE COLLECTORS AND DECIDED TO PUT ON A SHOW IN OUR AREA AS WE DON’T HAVE ONE. THERE ARE MANY PRIVATE COLLECTORS IN ST-LAZARE AND SURROUNDING AREAS. WE THOUGHT THIS WOULD ATTRACT MANY PEOPLE INTO THE CITY. WE HAVE BEEN WORKING ON IT FOR OVER A YEAR NOW. THE VERY FIRST THING WE DID WAS COMMUNICATE WITH DEALERS AND COLLECTORS TO SEE IF THERE WAS AN INTEREST, AS WELL AS LOCAL RESIDENTS AND BUISNESS OWNERS. THE REACTION WAS HUGE AND RECEIVED A LOT OF POSITIVE FEEDBACK. Do you also collect items personally? If yes, what do you like and collect personally? WE COLLECT ANYTHING OF COLLECTABLE INTEREST. FROM COMIC BOOKS, COINS, MILITARY, ANTIQUES, TOYS, ETC.. Anything to add about the upcoming show? HOPING TO SEE YOU ALL ON SEPT. 09, 2012 AND BRING YOUR FRIENDS TOO! There is a really cool sport cards and toy show in the South Shore. The show will feature dealers from various parts of the country selling sport cards and collectible toys. It takes place on Saturday, March 26th, 2011 at the Place Desaulniers in Longueuil, Quebec. The Montreal ToyCon Recap by Board To Death! There was a lot of different vintage and new toys for all collectors. Here are some photos of the Montreal ToyCon held in October 2010. We plan to have another show in Spring of 2011….we hope to see you all there…. If you’re into action figures, collectibles or Lego building blocks, this is definitely the convention for you. The ToyCon boasts a huge assortment of toys and vendors (over 50 tables! ), plus a strong showing from some of Montreal’s coolest clubs, including QueLug Lego Club,Legion of the Bat Club and the Canadian Garrison of the 501st Legion (look out, Star Wars fans!). So if you’re looking for that one hard-to-find comic or toy, great bargains on some of the best items our there or just a fun way to spend your Sunday, make your way down to the Courtyard and stop on by! (Near Mega-Plex Spheretech 14 Guzzo). Metro Cote-Vertu, Bus 121 West. The Montreal ToyCon Post-Con: QueLUG! The Quebec LEGO User Group (or QueLUG) has been a presence at every Toycon thus far and they’ve outdone themselves yet again with some truly awesome displays of…Legoism? Lego-ocity? Truly awesome displays of Lego talent. As always, we were happy to have them enriching the whole ToyCon experience with their meticulous-yet-creative designs and can’t wait to see what they bring us next time! The next Montreal Toy and Comic show will be held on Sunday, May 3rd, 2009 from 10am to 5pm. Be there or be square! Tons of Action Figures, Statues, and Toys (ie. Transformers, Star Wars, GI-Joe, Marvel, DC, McFarlane, Neca, & more). Are you a dealer or retail store that wants to display at the show? Tables (six feet long) are only $45 each (taxes included). Check out the Montreal ToyCon website for more details.